Sophisticated adventurers have long admired the vistas offered from the vantage of a hot air balloon over Hunterdon County. No better time than autumn to relish the sights and sounds both above and along this singular stretch of ground. Graced by gentle hills and abundant valleys of the Lamington, Musconetcong, Raritan and Delaware Rivers, Hunterdon County boasts a culture rich in tradition and style, and a serene beauty made more enchanting by the changing of the season. Northeast Hunterdon County is a feast for both the eyes and the soul. Rolling hills, charming 18th century villages, farms, horses made frisky by the cooler weather, and brilliant fall foliage bring you back to gentler days. County Route 517/523 north from Interstate 78, Exit 24 will start you in the right direction towards Tewksbury Township and Oldwick. 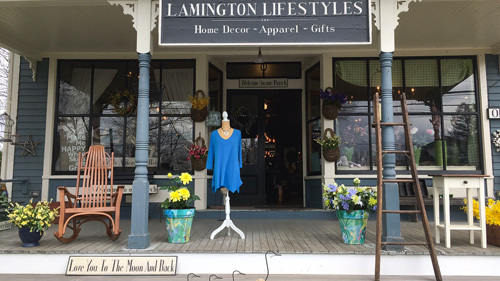 After a line of stately Victorian homes built by prosperous farmers, you will see 18th century buildings that hold an antique and country gift shop, a design shop, children's shop, a spa, and offices. There's an old Methodist church, as well as an even older Lutheran church that lost its tall steeple in the blizzard of 1888. The old general store is known for its sandwiches, while the inn offers gracious dining as well as lunch. Continue north on Route 517, also known as Old Turnpike. That's just what it was in the 19th century, complete with tollgates. The magnificent hills hold a wonderful mix of colorful woodland. Turn left onto Route 512 at the traffic light and head for Califon, a village heavy in history, but not the dry stuff of dusty textbooks, rather the lore and legend of a "Saturday night town", where farmers from all around once came to shop and socialize. Architecture in Califon is a continuum from the American Revolution through the Victorian era to the present day. Many contemporary businesses are housed in the older buildings: an art gallery, mosaic shop, a market, hardware store, book shop, and a combined flower, antique, and gift shop. Califon straddles the South Branch of the Raritan River, and it is here that the water begins to widen and strut just a little, suggesting the beauty that lies ahead. If you've brought your bike or your walking shoes, you can access the Columbia Trail at the Califon Station and begin a delightful expedition into a most notable exponent of tranquility in the Skylands, Ken Lockwood Gorge. The Gorge is also accessible by car from Route 513, across the river at Hoffmans Crossing and right on River Road. But, if you can, walk or bike in. Once you're in there, you'll want to shed all vestiges of tires and engines. 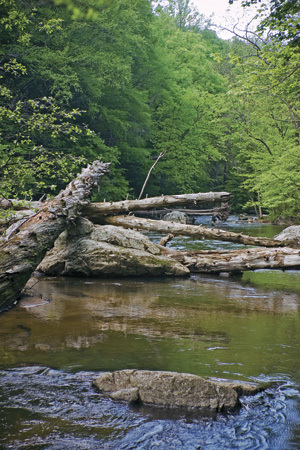 So named in dedication by Trout Unlimited for the conservationist and fly fisherman, Ken Lockwood Gorge is immediately reminiscent of someplace in Montana. Leaving Ken Lockwood Gorge you'll be a few minutes from Vorhees State Park home to the Paul H. Robinson Observatory, facility for the NJ Astronomical Association. Call ahead (908-638-8500) to see if you'll be lucky enough to schedule a look through the telescope. Besides a vantage point for looking at the stars, the hill provides a panorama especially spectacular in the fall, and one which affords a view of Spruce Run Reservoir near Clinton, the South Branch's final destination on this leg of her trip through Hunterdon. North of Route 513, towards the Musconetcong River, Lebanon Township holds the remnants of some lovely old villages. Come again to see Woodglen, where you can visit the old general store for a snack, and the villages of Changewater and New Hampton, along the river bordering Warren County. Another few minutes down Route 513 waits High Bridge, originally an "iron town", with forges providing cannonballs for our army in the Revolutionary War. It holds a mixture of the large homes of the foundry executives and wealthy merchants, along with houses sheltering the foundry workers. Today, the town hints "Renaissance" with bustling businesses renovating the old buildings along its quaint Main Street, a new coat of paint on the railroad trestle and Victorian-style street lamps. One shop offers clothing, bedspreads, and other items made of chenille. Another has an extensive collection of dolls and toys. The old railroad freight station won an award for its metamorphosis into an art gallery and café.